On an April evening in Port Au Prince Darryl and I were connecting on the rooftop of the guest house we were staying at. This became tradition for us during our time in Haiti, after the busyness of the day we would talk out our emotions and thoughts, unwinding together. Darryl shared a vision of starting a farm in Port Au Prince, a place to grow food, encourage sustainability and empower the people to care for themselves. He said he wanted to build something up, train the locals to run it and then pass it on to them to help the community flourish. When we returned home Darryl was given a job on a small, local, organic farm. It was an amazing opportunity. It was small and intimate, relatively new and flourishing. Prior to this Darryl had no agricultural experience so he began to learn and through this experience his hunger for more knowledge was awakened. We have always been passionate about eating well to take care of our bodies and helping other do the same so it all made sense to learn more about organic farming. When that season came to an end we took a different turn in our focus as we prepared to welcome our first baby. The time of transition was busy and sweet, yet all the while, in the back of our minds and often in our conversations we talked about returning to Haiti. 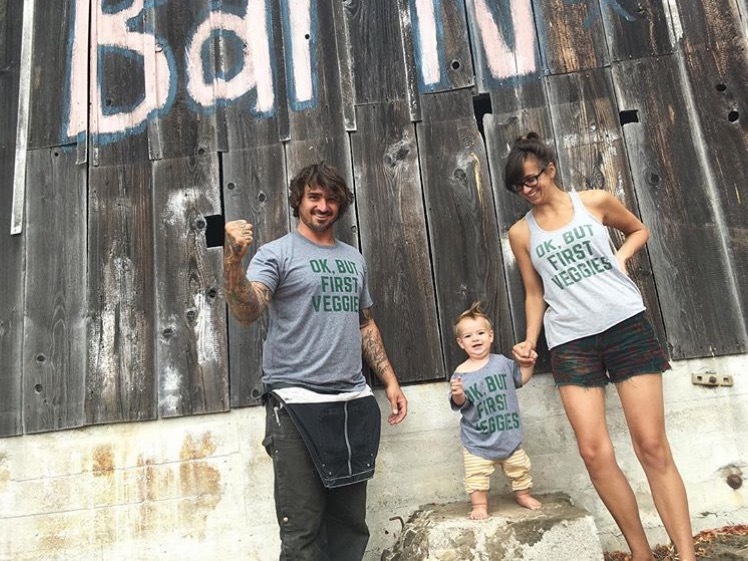 A few months after our baby was born Darryl was welcomed on to yet another local, organic farm. This time the bounty is 100% donated to members of the community, such as recovery centers, soup kitchens for the elderly and terminally ill. This farm and the circumstances surrounding how Darryl ended up running it (with his limited farming experience) were completely from The Lord. Since Darryl has been the main force behind the farm he has learned an incredible amount of information by reaching out to others in our local farming community. He has made great contacts who have been so generous with their knowledge of sustainability and organic farming. Somewhere along the way we caught wind of what Harvest 107 is doing. Of course we were immediately intrigued and absolutely thrilled at their vision and work they are doing. It felt very clear, given our desires and heart for agriculture and mission, that we would have to come alongside this amazing family at some point in our journey. So we’ve worked out that January of 2017 we will take our family of three to Haiti for three months to intern under these anointed people, learn all that they have to offer and give our hands for them to use as they will. We are completely humbled and so excited to be working with Harvest 107, we believe so much in what they are doing and are so looking forward to stepping into it. After meeting this awesome family online, we immediately felt a kindred spirit. We are excited to see what’s in store for 2017! Want to be part of this exciting journey? Follow along and read more on the Kuehls’ blog or help fund their time with us with a donation (below).